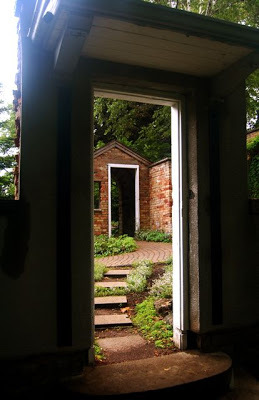 This little paean to one of Toronto’s hidden garden gems is long overdue. Set at the edge of the Bluffs near where Kingston Road merges with Danforth Avenue, Rosetta McClain Gardens [link updated 11/21/15] is a beautifully manicured space, or should I say: series of spaces. All of them are worth a visit. At the centre is the fountain above, surrounded by raised beds circled by a pergola and pleasant places to sit and enjoy the view. 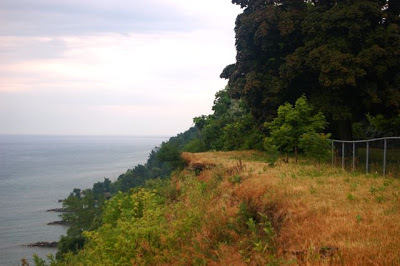 On its south side, the Bluffs drop away to offer a bird’s-eye panorama of Lake Ontario. Closer to the park entrance on the north side, plantings include a decorative herb garden, and there’s a composting area to the west. Following a path to the east will take you to one of my favourite sections, the folly – really, a cleverly dismantled brick bungalow framed by garden beds. In the northeast corner, a formal rose garden perfumes the air, and a long bench overgrown with hydrangea becomes a garden sculpture. From here, it’s a green, shady walk through mature trees back to the bluffs. I’ve had these pictures since a drizzly day in July 2007 when I was inspired to visit with my camera. 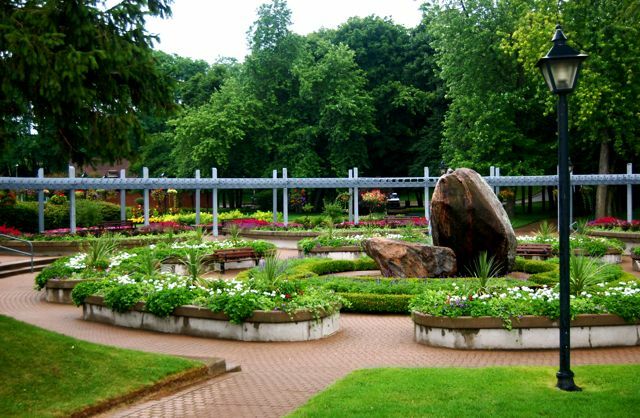 But Rosetta McClain and I have long been acquaintances, as the park has been a landmark on my group’s power walking routes in every season for five years or more. 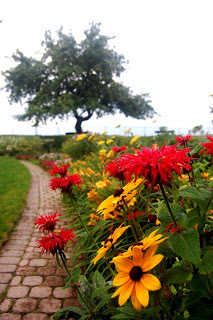 It’s easy to find some visual or horticultural treat to distract you here. The gardens are a frequent choice for wedding photographs. Yet, as small as it is, it has never felt crowded. There’s always a quiet corner you can hide away in. That’s a good thing to know about in a city of millions.